With increasing life expectancy and better medical services, the number of senior citizens in India is increasing rapidly. Studiespredict that the percentage of people over 60 years will constitute nearly 20% of the country’s population by 2050. With better mobility and higher quality of life, senior citizens today are looking for the right retirement homes to spend the golden years of their life. With the rise in nuclear families, children living overseas or in distant cities, more and more seniors in the country are choosing senior residential homes. However, there’s still plenty of misconception and myths about senior living options in the country. The only thing common between the two is that elders lives in these homes. The terms senior living and old-age homes are often used interchangeably, even in the media, and this has lead to misleading information about retirement choices for seniors in India. Some even use words like ‘luxury old age home’ but then what they actually mean is senior living facility in India. Here, in this article, we show you the key differences between the two and help you understand what to expect from each. The conventional old-age homes (both government operated or private owned) are often seen as places of loneliness and gloom. Understaffed and no proper training for staff, lack of facilities – spending one’s retirement years in these institutions (either out of choice or by no other go) doesn't sound appealing. Most of the taboos and fears around retirement living options stem from old-age homes. Considered as places of loneliness and abandonment, old-age homes are certainly not the best residential option for senior citizens. However, all that is changing thanks to the arrival of senior living homes that are a unique concept, widely different from the old-age homes of the last decade. What Are Senior Living Homes? These are residential hubs that are fast emerging as the number one choice for senior citizens. Thanks to the initiatives of private builders including Ashiana Housing, senior living communities with world-class amenities are now available all across the country. These retirement communities are sprawling, residential, multi-unit complexes designed especially for seniors. Also, known as retirement villages, these villages are “campus” style and have independent living units (known as senior living homes) as well as various other facilities and amenities like – landscaped grounds, community halls, recreational, medical facilities and more. Some senior living homes also provide assisted living options for frail seniors who need it. Here are three key benefits offered by Senior Living projects. Senior Living promotes the idea of independence and choice. These are 1BHk, 2 BHK, 3 BHK homes or villas with senior-friendly design and assistive technology. Seniors make their choice with regard to their daily routines and lifestyle. There is no compulsive routine or restriction imposed on them as done in several old age homes. Spaces to Hone Your skills or Learn New ones. 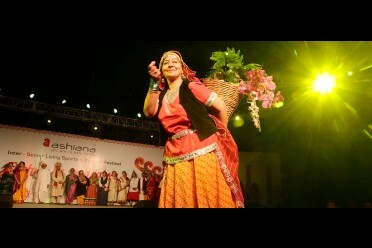 A platform to help seniors rediscover their innate talents, hobbies and passions is provided here. In some cases, seniors who always wanted to learn to dance but never did have given themselves a fresh chance to explore dancing. Likewise, for other hobbies like singing, painting, etc.- seniors get a chance to engage in learning and improving on various skills. Impact on Overall Health: With various social, mental and physical activities, seniors live a fulfilling and stimulating lifestyle, leading to improvement in their health and wellness. There have been several cases of senior moving to senior living projects are reducing their dependencies on medicines and supporting equipment. What are Continuous Care Retirement community (CCRC)? These are senior living communities that provide extra medical care and assistance to seniors as they grow older. As you age, you may require additional in-home services like – physiotherapy, bathing, medicated dressing, feeding, grooming and more. Continuous Care Retirement community (CCRC) provide you with trained staff, who helps you with your personal tasks right at the comfort of your apartment in a senior living community. You can consider them as luxury old-age homes without the drawbacks of traditional old-age centres. Old-age homes offer the bare minimum facilities. Seniors can expect it to be like an institution where they can spend their sunset years, free from household chores and tasks. But, beyond that, old-age homes lack major facilities. Key facilities available – rooms for sleeping (mostly dormitories or shared with a couple of other seniors), a common dining hall, a lounge to receive visitors, and common bathrooms. Retirement villages are made up of independent living units (also known as senior living homes). You can consider it as an apartment complex, designed for seniors. So, you can expect all the facilities that you can find in a regular residential apartment complex, with special features to aid seniors. All apartments are self-contained home units with master bedrooms, guest bedrooms, bathrooms, living rooms, balcony, kitchens, and dining rooms. You are in full control of your apartment, and you have the space to live independently, while the opportunities to mingle and engage with other seniors living in similar residential apartments in the community. However, since senior living communities are designed for seniors, most apartments contain several accessibility features like gentle slopes (no stairs), anti-skid floors, chamfered wall edges, easy-reach light switches, night switches in the bedrooms, grab rails in the bathrooms, emergency response system and more. Old-age homes provide only the barebones infrastructure for seniors. Individual space is minimal, and most seniors are provided with a bed, a cupboard to hold their clothing and other knick-knacks, mostly in shared dormitories. Bathrooms are also shared. Also, known as skilled nursing centres, old-age homes can be compared to a hostel for senior citizens. With minimal facilities, and mostly dorms or shared rooms, senior citizens in old-age homes have to give up their independence. These retirement homes are designed from the ground-up keeping the comfort and convenience of seniors in mind. This reflects in the infrastructure of the ILUs (Independent Living Units) as well as common infrastructure. 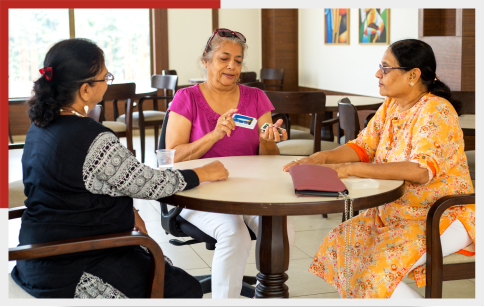 Open grounds with manicured lawns, ample recreational facilities like gyms, swimming pools, indoor and outdoor games, common community halls, restaurant-style cafeterias, supermarkets within the campus are some of the common infrastructures you can spot at paid senior citizen living homes in a retirement village. As we age, our bodies lose the mobility and flexibility of our youth and are likely to catch frequent infections and other illnesses. Thus, seniors require the right medical care available at all times. Some old-age homes may have trained medical staff at the premises. Most old-age homes provide their inmates with treatments at a nearby hospital, in case of illness or emergencies. Senior living communities have trained medical staff who live on the campus and can provide first-aid and immediate medical attention in case of emergencies. Furthermore, all retirement villages have tie-ups with leading hospitals, where residents can go in for regular medical check-ups and special treatments. In a retirement village, you are free to drive around on your own, or you can request the staff to provide you transport from and to the hospital for your checkups. Most senior living apartments also provide extra medical care and assistance when needed. Additional in-home services like – physiotherapy, bathing, medicated dressing, feeding, grooming are provided to seniors who have restricted mobility and require extra care. You can also request the services of paid help and maid to clean your apartment. Also known as Continuous Care Retirement, you can avail the services of trained staff, who help you with your personal tasks right at the comfort of your apartment in the community. In old-age homes, food is served in a mess-style cafeteria. You can choose between veg or non-veg food depending on your dietary preferences. However, there are no facilities for you to cook on your own. In a senior living community, you can continue cooking meals in the kitchen in your apartment. However, if you wish to take a break from cooking your own food every day, you can have delicious, nutritious and balanced meals in the community café halls. You can enjoy restaurant-style meals that are fresh, delicious and tailored to your special dietary requirements. With a break from cooking, you no longer have to bother with grocery shopping, meal planning and spending hours in the kitchen. Old-age homes have fixed visiting hours. Inmates can receive their friends and family only during these hours. It’s not possible for your children and grandchildren to stay with you. In a retirement village, you are the owner of your apartment, and you can continue receiving and hosting your children, grandchildren, extended family and friends as always – as you do in your regular home. Most old-age homes don’t have much recreation and entertainment to keep inmates occupied, apart from common TV viewing halls. In senior living communities, you have a wide range of activities available on campus to help you make the best of your silver years. 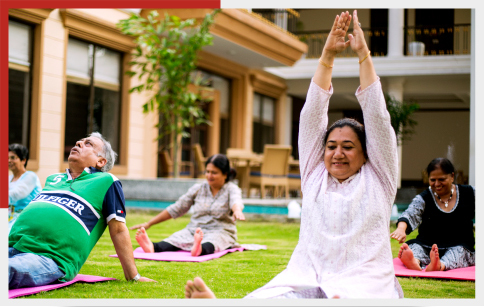 Yoga, swimming, gyms and fitness centres, table tennis, badminton, indoor game halls, meditation and Satsang classes – senior living communities provide you with a wide range of recreational activities and hobbies to spend your time engagingly. The best part – you become a part of a like-minded community of friends and neighbours, who become family. The emotional support system provided by senior communities helps you enjoy a long, healthy and happy life, even post-retirement. Both old-age homes and senior living communities are safe and secure for seniors. They have security staff on campus, monitoring the premises and providing immediate help to seniors in case of emergencies. Senior living homes are monitored by trained staff, and you can find CCTV cameras at all vantage points with round the clock surveillance. Additionally, all staff are trained to provide emergency first aid. Most senior living communities offer an emergency response system in each apartment. On-call doctors, ambulances on alert, and 24 x 7 emergency care, you no longer have to worry about your safety and health care in a senior living community. The biggest problems seniors face post-retirement are dull social life with no or few peers nearby, and loneliness, which takes a toll on their psychological and emotional well-being. Though old-age homes have several seniors living in close proximity, they feel like they are living in a “hostel-like” institution. They don’t have the space or facilities to engage in an active and vibrant social life. In a retirement village, you have several peers in your age group living in the complex. And, thanks to the wide array of engaging activities and entertainment options, you can build your social network and make like-minded friends. Retirement villages are more than luxury old-age homes. They are vibrant communities, where you get to enjoy your sunset years in the best of company and emotional support. With world-class amenities, thoughtful infrastructure, trained staff members who take care of the nutritional and other needs of senior citizens – senior living communities today in India are on par with what’s offered in the western world. More and more seniors looking to spend a quality life during their golden years are opting for Senior living communities. Choosing the place where you will spend your golden years is a huge decision. So, before you pick any one choice, visit all the different options available to you, consider the pros and cons and then arrive at a decision. Some senior living communities even offer you a trial living experience, where you can stay, evaluate the features and facilities available on campus and then arrive at a decision. Make an informed choice and enjoy your sunset years happily, comfortably and healthily.